After making that Batman of Zur-En-Arrh custom I’ve been going a bit custom-crazy lately, looking for cheap figures I can add to my custom pile, so last weekend the missus and I ran some errands and I had toys on the brain. We went to a Toys “R” Us which yielded nothing unfortunately, but also a Big Lots type store called What A Store. Now that I think about it, it’s more of a dollar store smashed together with a Big Lots. I was hoping to get some super cheap toys, instead they had these 69 cent crappy bootleg “Hero series” toys. 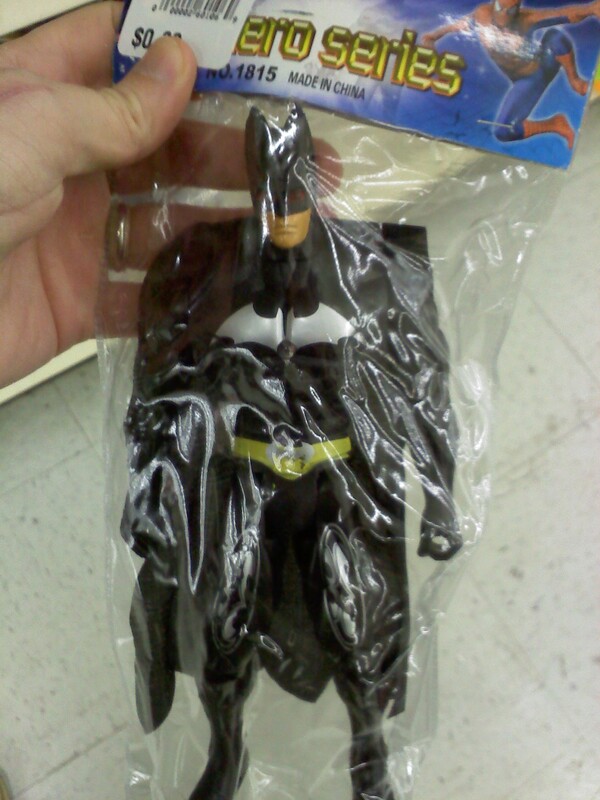 Anyone who has seen a crappy bootleg figure has probably seen something very much like this. I’m always surprised with the weird flourishes bootleggers add here and there, like the red eyes on Batman and that crappy jewel thing in their chests. They actually did an okay job nailing Batman’s costume here. 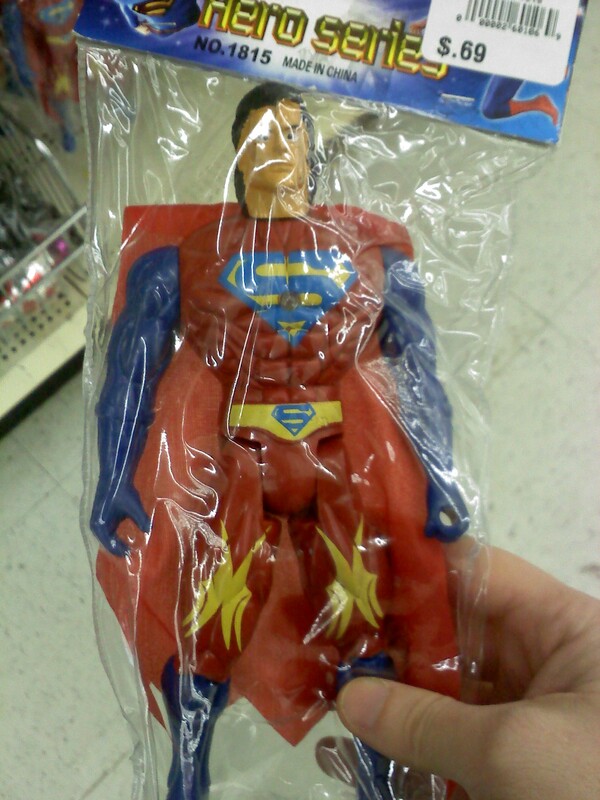 And here’s the Superman figure, gotta love that wild costume design with the weird fire-like paint job on the thigh. 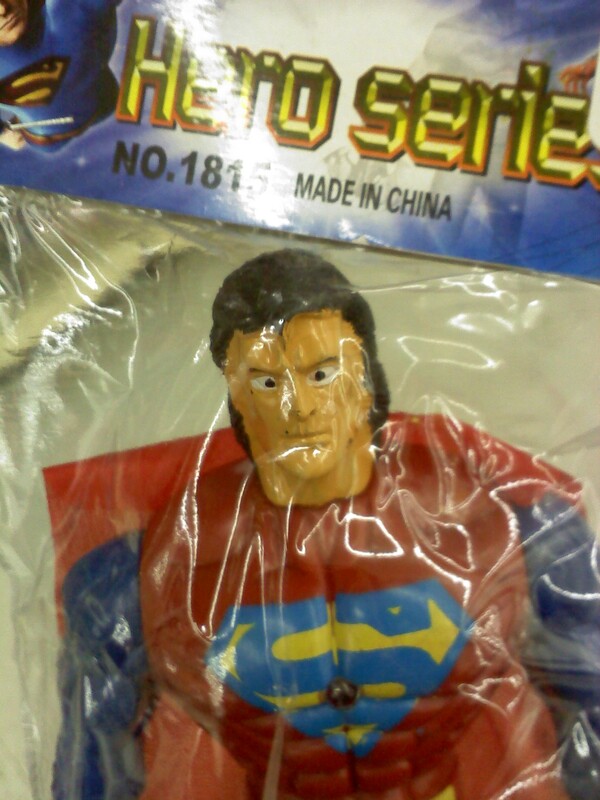 But my favorite part of the Superman figure is the ridiculous look on his face. He looks like Jim Carrey in The Mask. For the record, I didn’t buy these toys. The only bootleg toy I’ve ever bought was a Batman with a sniper riffle who you could wind up and he’d crawl across the ground. Unfortunately, it got lost int he shuffle when we switched offices at Wizard.